Bristol 2014: Audeze launches £1600 LCD-XC headphones | What Hi-Fi? We were impressed by Audeze’s open-back LCD-3 headphones when we reviewed them last month, so we were excited to see what the company had brought to its stand at the Bristol Sound and Vision show. More luxury headphones caught our eye, this time in the form of the LCD-XCs. 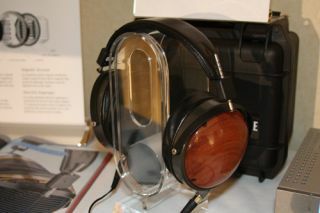 They are the closed-back headphones in the range, and bear a similar high-calibre build to the LCD-3s. The earpads are made of lambskin leather, and the aluminium enclosures don the familiar glossy wood finish – albeit this time they are sloped and available in Bubinga (brick red, as pictured), purple heart, iroki (light brown) or walnut. The company’s ‘Fazor’ elements, exclusive to the XC and X models, are designed to improve sound quality by improving phase and frequency response, as well as produce a greater frequency range and better stereo imaging. The Audeze LCD-XC headphones are out now and can be yours for £1600.